I am in Kabul now. Over the last few weeks I was in Hamburg, Germany, for a Summer school on freedom and responsibilities in media. What a wonderful occasion and what wonderful people from 18 countries who I’ve met there. I miss all of them now and the only thing that remains with me are memories and pictures. If this course was held in Kabul, it might not have been so successful and interesting. In Germany I had to learn every step, I had to learn about the people, cities and culture. I came back with lots of information and memories that I am now sharing with my friends who are coming to meet me. One of the topics we had to work on was ‘dealing with the past’. Working with 8 people from different countries in one group on how we can deal with the past is not such an easy job. In most of the cases it is taboo to write about the past or it might not be so secure, or even dangerous. In a situation like Afghanistan it is very difficult to write about criminals and the warlords who are in power right now. But alas, in our class we never thought about the hows, and which methods we could use to write about our past. But now, I don't know what to do with these criminals who are in power and still threatening. We only overviewed the history of Germany and the time when the Nazis committed genocide. For several days, my heart was wounded. I couldn't imagine what happened to Jewish people there. 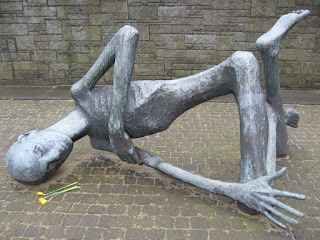 But some times it was also very irritating when some of my colleagues were making funny pictures with the commemoration statue of a Jew who died from the severe conditions of living in one of the concentration camps. Maybe they had only eyes to look at the statue and the pictures around them. Maybe they only have eyes to look but have no heart to feel. May be most of us are like this, without doubt. Who feels our pains here? No one. The Neuengamme concentration camp, close to Hamburg in northern Germany brings tears into your heart. You cannot believe how brutal and savagely those innocent people were killed. May be, this is an example of savageness of a period in history that reminds us to look back, to what has happened in the past. “We can not forget, but we can forgive always”, is a fine quote from Nelson Mandela. Anyway, the workshop gave me the idea to build a group of researchers, to research about the massacre and genocide of the Hazara people of Afghanistan. In the 1880s in Afghanistan, King Amir Abul Rahman Khan committed a first Hazara genocide. Later in 2000, when the Taliban captured Mazar-e Sharif they massacred a number of 10,000 of the Hazara people, and when they captured Bamyian again they killed more than 10,000 of people. Today talking about the massacres and the civil war that took place in the 1990s has become a big taboo. If you talk about what happened during these times, you are labelled as an enemy of unity. I hope to make a research-centre to research our past. This can also help Internationals because they can learn how many problems we had in our past. Unfortunately today, foreign politicians and those people who intend to favour Afghanistan and who are theorizing the construction of an Afghani nation-state don’t see that this will be a completely impossible mission. They have the wrong approach.